Ever since my Pittsburgh friend told me about a local delicacy called "pierogi pizza", pierogi have been floating around in my mind. When the opportunity to join this campaign was made available, I opted in since it was obviously my calling. 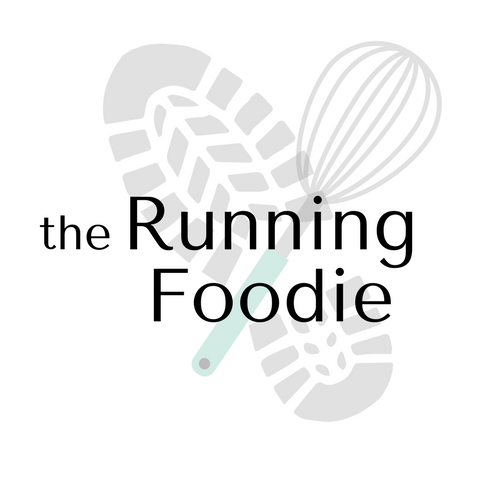 Despite making most things I eat from scratch, I do like to keep tasty and easy to prepare foods on hand for lazy evenings, post-run snacks, and spur of the moment get-togethers. 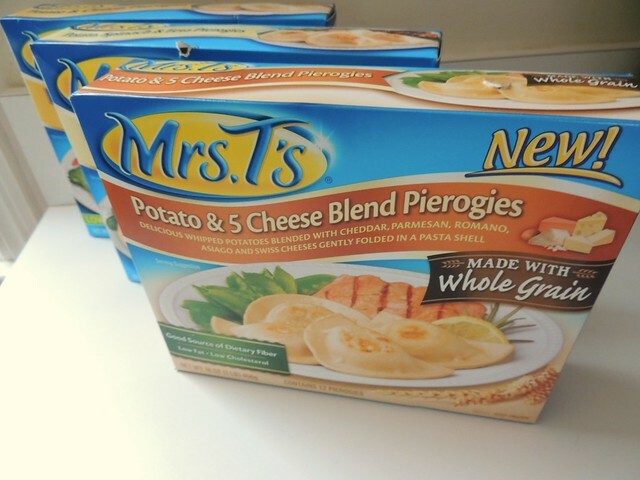 Mrs. T's frozen pierogies are right up my alley in that regard. I picked up a few different flavors that stood out to me, and those were potato & onion, potato, spinach, & feta, and potato & 5 cheese blend made with whole grain. 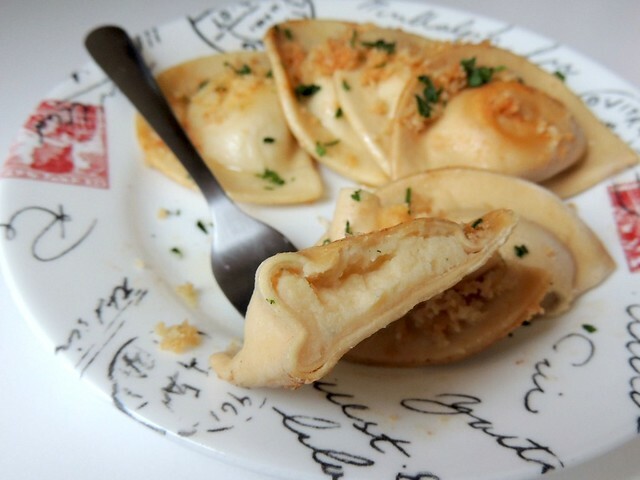 The pierogi are made with a whipped potato filling consisting of dehydrated potatoes and various flavoring. In the two flavors I tried, the fillings were pureed. I'm not sure if this is typically how pierogi are made or not. Each box contains twelve pierogies, serving 4 people. 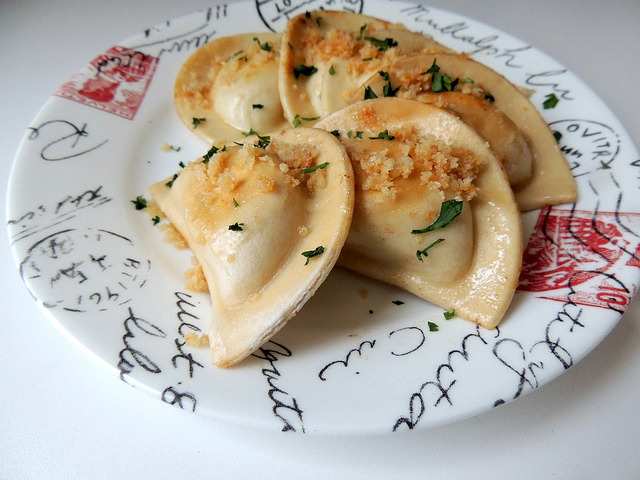 If you prepare the pierogi in addition to a meal, just three per person might be enough. I cooked up six for myself. 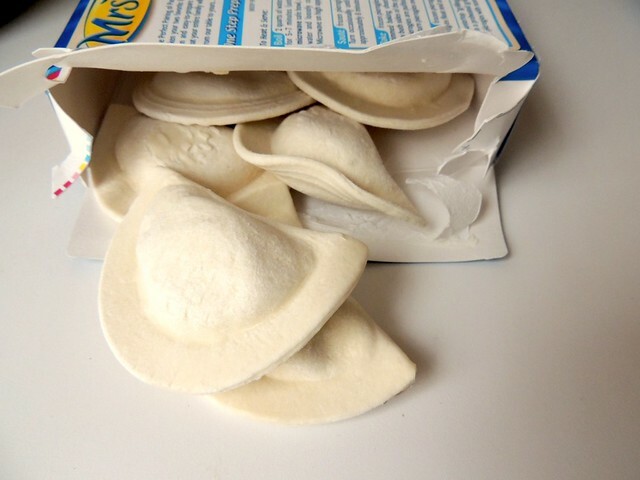 I didn't like that there wasn't a resealable liner in the box for any remaining pierogi, but putting them in small freezer bags is easier to store anyway. 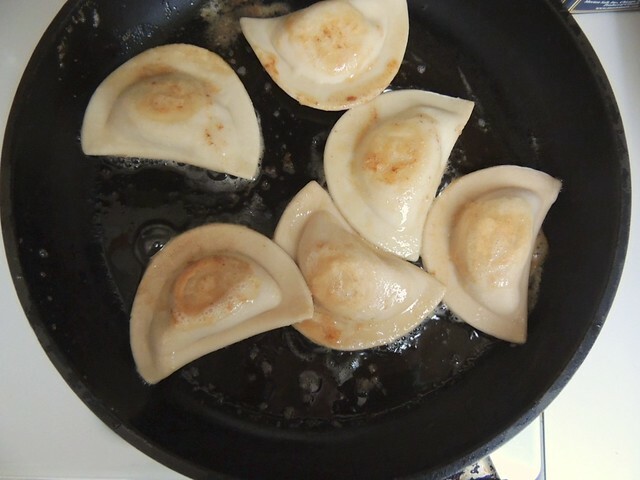 There are five different ways to prepare the frozen pierogi, boil, fry, bake, saute, or "grill" in a grill pan. I chose to saute it because, more butter. It takes just eight minutes to prepare this way, and the pierogi get a nicely browned, crispy shell. After they were done, I sauteed panko breadcrumbs until golden brown and sprinkled it over the pierogi, topping with fresh parsley. This would be a good way to prepare the pierogi, alongside a dip, for a friendly gathering. They looked good, but did they taste good? I thought so. The flavors in the two varieties I tried (potato & onion and potato & 5 cheese blend) weren't as pronounces as I expected, though that's not a con in any way. I couldn't really tell the 5 cheese had whole grain in it at all. Overall, I'm a fan. I look forward to working my way through the remaining pierogi in the freezer. To connect with Mrs. T's Pierogies, visit Facebook and Twitter. My method for making Mrs T's -- Boil pierogies until they float. While you are doing this, saute onion slices in butter until browned. Add drained pierogies to the butter/onions and saute until both sides are brown and crispy. Serve with sour cream if desired. And I pretty much only buy the regular potato and 4 cheese blend. I will try this method, thanks! I like the idea of serving it with onions. I PITY THE FOOL EATS THE LAST ONE!! !